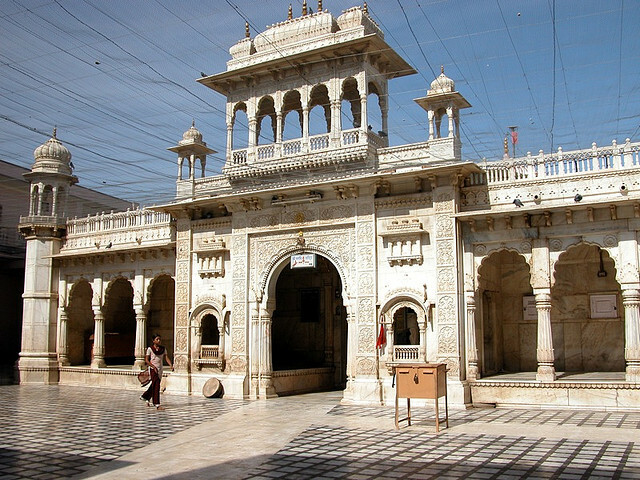 Situated en route to Jodhpur, the temple is dedicated to Karni Mata -an incarnation of Durga. The temple has fascinating huge silver gates and marble carvings that were donated by Maharaja Ganga Singhji. The most attractive feature of the temple are the rodents who scamper freely within the premises and if one touches your feet it’s considered auspicious. They are regarded sacred and devotees buy prasad (feeding) to offer to them. Karni Mata was endowed with divine powers. The daughter of Meha Ji Kiniya, Karni Ji incarnated on 28th Sep.,1387 at Suvap Village in Tehsil Phalodi of Jodhpur District.She was marrid to depaji.The present deshnoke was founded by her on Baisakh Sudi Dwitiya Samvat 1476. Karni Ji developed the area into a sanctury and anyone seeking asylum in this area was put to no harm. People accused of crime used to come here and adop sanityto get themselves absolved of their sins. Karni mata witnessed the accession to royal thrones by three consecutive generations of rulers Rao Ridmal , Rao Jodha and Rao Bika. She was instrumental in enabling those three kings to get the reins of power . Rao Bika beseeched her blessings and founded a new empire in 1488A.D. Karniji arranged his marriage with the daughter of Bhati Rao Shekha of Pugal, who was in prison at that time at Multan. The marriage procession arrived and as the presence of bride’s father was essential in the circuit ceremony, Karniji flew-off to Multan in the shape of an eagle, brought Shekha with her and caused him to complete the ceremony. Rao Bika sought her advice for each and every important issue and worked according to her instructions. Several instances show that whenever the kings of Bikaner found themselves in trouble, they remembered Karniji and with her blessing succeeded in getting over their turmoil. The royal family of Bikaner always held Karniji in great esteem. The ‘Garbh Griha’ of deshnoke temple was founded by Karniji herself. The marble construction was completed in the time of Maharaja Ganga Singhji with superb architectural and artistic designs. Mata Churned curd with wooden form of dry tree which was later transformed into green vegitation .deshnoke has given us renowned men of literature. The Charans are famous for their literary creation and devotion to the deity.People here live in peace, harmony, and fraternity.Karniji’s name is attached to all sorts of social, literary and religious institutions. 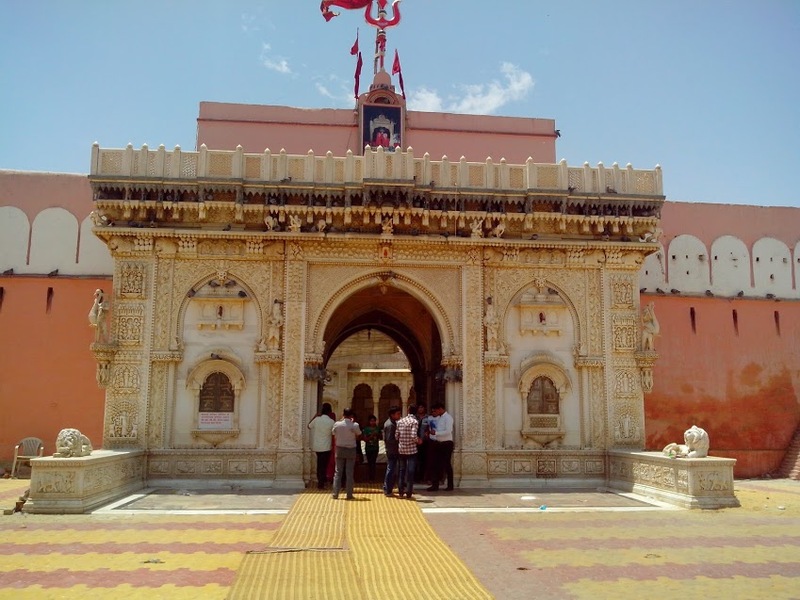 Pilgrims come to pay their homage to Karni Mata twice a year at the time of Nav Ratra. The ‘ORAN’ is a sacred and protected area fore trees. There is the strict prohibition for cutting the trees. Karniji’s far approaches for the protection of the environment and keeping it unpolluted has saved people from many vicissitudes through the centuries. Karniji’s blessings are always with the people of Bikaner.